I’ve recently discovered that if I hustle out of my office for my lunch hour, jump on the uptown C train and get off at 72nd St I can spend some time birding the west side of Central Park while I work my way north to 81st St to get on the downtown C train by the Museum of Natural History to go back to my office on 42nd St. Even though there are two train rides and a half-block walk to and from my office I can still get a solid half hour of birding in, a wonderful midday stress reliever. A recent lunch hour spent this way was devoted almost entirely to photographing a horde of Common Grackles that were feeding, mostly on fallen acorns, on leaf-covered slopes in Central Park. At first I was content to wait for the grackles to come to me but eventually I noticed that whenever an acorn dropped from above the grackles would scramble to be the first bird to it. I took advantage of this by picking acorns up off of the path and tossing them up in the air, trying to get them to land where I wanted the grackle to be. I think that technique, combined with my 100mm macro lens, worked rather well, but I will leave it to you, kind reader of 10,000 Birds, to judge. I hope you enjoyed the iradescent plumage of Quiscalus quiscula as much I do. This post has been submitted to Bird Photography Weekly #62. Go check it out! I particularly like the third image of the iridescent plumage. Reminds me of the mother of pearl in so many mollusk shells. Quite beautiful. 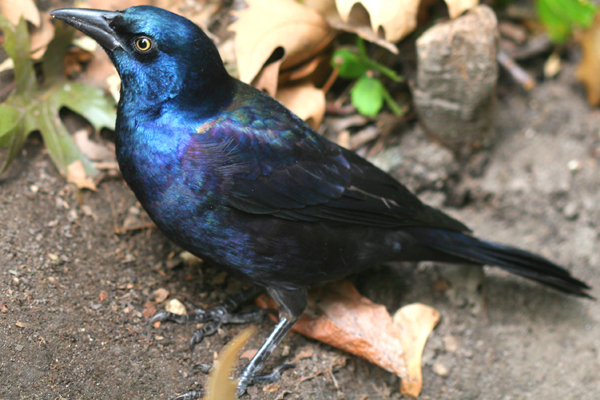 Grackles always seem to get a bad rap for being noisy, greedy hogs but they’re just so darn attractive. Lovely shots, Corey. I’ve always had trouble drawing common grackles when they make a brief appearance in our backyard and getting the way that their head curves into the their bill, as well as the relation of that curve to the culmen. Now I have a much better idea. Sounds like a great way to have lunch! Beautiful. The extreme close-ups show us so much that we ordinarily never see. Wonderful shots Corey, you’ve capture the iridescence magnificently. Wow, you just made Grackles interesting! I to agree WOW, you were able to make the Grackles look wonderful. The iridescence is captured beautifully. It’s nice to see a kind word written for them. We humans seem to dislike all the smartest birds. And they are beautiful – love the close up of the feathers. Wow! You got the sheen of the feathers up close! amazing! Looks like it worked well. Great photos. 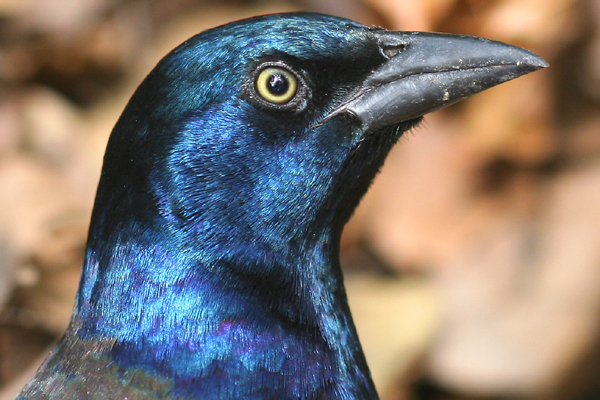 Well Corey, you sure got some magnificent shots of the Common Grackle! Absolutely gorgeous! I admire your tenacity in getting those shots and your enthusiasm for getting it all in within your lunch break. Very nice job. Wow! 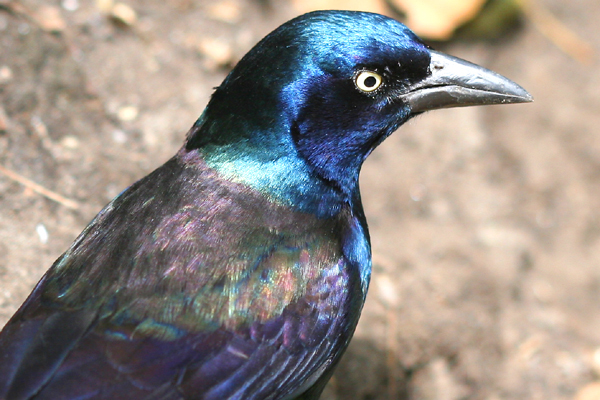 These are beautiful shots of the grackle. You capture their iridescent colors so well. Sounds like a great way to spend lunch!